Introducing Classic value for the optimum wine storage experience. Whether you're looking for a starter cellar or really dependable storage, our Classic Series are the economical solution. These cabinets are highly effective, protecting your investments with top-quality wine storing technology. The Classic 15" Wine Refrigerator is ideal for under counter applications, this unit is front venting and wide enough to fit most standard trash compactor spaces. Is it possible to shorten the installed height by removing the feet? If so, what would be the minimum installed total height? Is the door reversible? Can the handle be removed? Hi, the door on the Classic 15 wine cellar is not reversible. The handle can be removed but the holes would be visible. The specs on the page here say the door has reversible swing? Do Riesling bottles fit in this cooler? BEST ANSWER: The Wine Enthusiast Classic 15 Inch Under Counter Wine Refrigerator can accommodate Riesling bottles. The rolling shelves can comfortably house your longer Riesling bottles with ease. Thanks so much, exactly what I needed to know! I'm afraid I am unable to answer this question, as the wine cooler was a gift to my son. I have actually not yet seen it. I do know that it was engineered for Bordeaux bottles, which are significantly shorter than a Riesling bottles. Perhaps the company can provide you with measurements. Good luck! Top shelf or bottom shelf. The others are too narrow. Pinots and Chardonnays likewise. Yes Riesling bottles fit nicely. The operating panel picture (page 8 of the manual) identifies #7 being a toggle switch between Celsius and Fahrenheit readings for the LED display - however, there is no toggle switch. How can the cellar be changed to Fahrenheit readings? BEST ANSWER: The unit comes pre-set to Celcius. To convert to Farenheit, first press and hold the lock button until you hear a beep. This unlocks the controls. Then, press and hold the light button and the + button at the same time. After 2 to 3 seconds, the temperature display turns to Farenheit. Then, you can lock the control panel if you want to. Personally, I don't see a need to lock the panel. 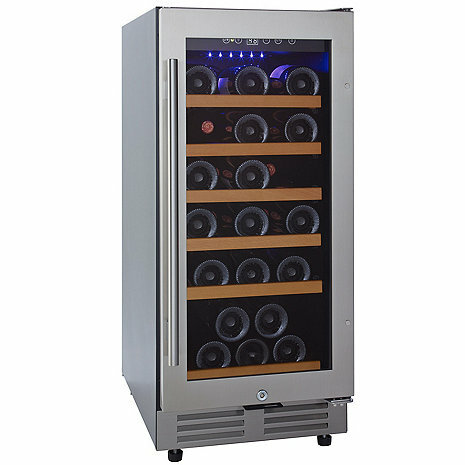 The Wine Enthusiast Classic 15 Inch Under Counter Wine Refrigerator can either read Celsius or Fahrenheit by pressing down the light switch and the plus sign switch at the same time. Carol, I no longer have the manual, but can tell you that when I open the door, there is a panel of setting options. The F/C button is 2nd from the right. Hope this helps. Thank you. Actually, on my unit, I have now learned that I can toggle between F/C by holding down, simultaneously, the "light" and the "+" buttons, which are the first two buttons on the Left. Again, thank you. Happy you found the solution. I find this unit to be just right for our needs, hope you like yours, too. Ours has the option to switch from Celsius to Fahrenheit on the top control panel upon opening the glass door. The combination of pressing the light button and the + button SHOULD be in the printed manual. What is the degree differential when set to a single temperature? +/- 1 degree or more? BEST ANSWER: The Wine Enthusiast Classic 15 Inch Under Counter Wine Refrigerator has a 1 to 4 degree temperature differential on either side of the set point. only has one temp setting. And + or - 1-4 degrees isn't important anyway. Consistent temp is key and the whole point of a wine cooler. Mine varies by +/- 3 degrees -- for a 6 degree range. Is it possible to store beer or other beverages on any of the shelves what is the height of the shelves? The bottom shelf looks taller. BEST ANSWER: You could set the temperatures to the lower 40's. The bottom area is open fro bulk storage. The upper shelves can hold up to 3 3/4' diameter bottle. I do. The lower shelves accommodate the larger bottles of champagne, Beer bottle and cans fit nicely on the other shelves. You woul have to lay the cans or bottles down and in the end, the beer won't be cold enough. Not a good idea. I don't understand the answer provided to the last question regarding reversing/switching the door swing direction? The manual specifications clearly states the door swing direction IS reversible. Please explain. Thank you. BEST ANSWER: This units door swing is reversible on this unit. I did not have to switch the way the door opens but details on how to reverse it are clearly outlined in the manual. I'm sure customer service can help you out if you run into trouble. It is reversible on the latest model, but the unit does not come with instructions. Call customer service for help. I reversed the swing and it works fine, just took some effort. BEST ANSWER: We've had several different ones over the last 12 years to fill our old compactor space. Had this one about a year and it is by far the best. Others constantly cycled, were loud, inefficient, motors not good. This one is quiet and we have had no trouble with it. SO far, it is a winner and it is quiet. Yes my unit is very quiet, even with the compressor running. When the compressor turns on if you are standing right next to it you may notice but the noise is negligible, from 10 ft away we don't notice. We placed our under counter cooler closest to the family room and there is no need to turn up the television when watching. It runs quiet and keeps all of our wine, beer and sodas chilled. It's quiet enough that I haven't noticed it. It's not a large unit but good enough if you have another unit or using it for a small amount of everyday wines. It's not silent, but it is less noisy than a regular refrigerator and quieter than most such devices. i suggest that you look for another brand. i did not find this vendor to be reputable. Mine is very quiet. I am sitting 5 feet away and do not hear it. No... this thing runs all the time... its pretty noisy. I haven't noticed any noise at all. Very quiet. can this unit be used in an enclosed cbainet with only the front door not enclosed? BEST ANSWER: Remember that the unit needs ventilation. If you have enough room on sides back and front panel then its a great way purchase. We placed our in and under the counter format so we can slide out to clean the floor and unit itself. I have mine in a similar situation and have no trouble for over a year. There is room in the space for air circulation and that seems to be sufficient. Good luck. Yes...it is front venting, and designed to be installed as you describe. Yes. Needs adequate ventilation all around. Maybe 1/2” all around. Yes. That is how I gave it installed. BEST ANSWER: The Wine Enthusiast Classic 15 Inch Under Counter Wine Refrigerator lock is centered on the bottom of the door of the refrigerator. Bottom center. In the main picture of the website, you will see a small circle, a brighter finish than the rest of the unit. At the center at the bottom of the door. This is better than expected. The lock is in the center of the lower panel of the door. The lock is on the bottom of the door, we never use it. Do you make a 15” left opening wine cooler ? BEST ANSWER: Our cooler opens from the right side but the door can be installed to open in either direction. We have been very happy with the unit. The door on this unit can be switched to either left or right opening. The space under my counter is 34 3/8 inches high. Is this enough room to slide the cooler in? BEST ANSWER: The critical measurement is the width. Make sure you have slightly more than 15" space for this cooler. The unit I received measured exactly 15" across the top, but it bowed out to 15 and an eighth inches toward the bottom. My undercounter space was only 15 1/8 inches wide, and the unit would not fit. I had to remove a piece of cabinet molding and plane it down 1/4 inch. It was a lot of work to remove the cabinet molding without damaging it. Yes. The width is more likely to cause an issue. Make sure you've got the full 15 inches. just purchased & having difficulty removing shelves - any tips? BEST ANSWER: I did too, but after checking that they weren't tied in place, I started again at the bottom and found it just takes a little effort. They seem to be designed to stay in place, but they do move. Thank you for reaching out to Wine Enthusiast. Please contact us at 800-648-6058, so that we may walk you through removing your shelves. BEST ANSWER: Patrick, The Classic 15 Inch is currently only available in the stainless steel finish. Does this model accept custom panels? BEST ANSWER: Thank you for your question. Unfortunately, this model does not accept custom panels at this time. Thank you. I am pleased with the look and it's working very well. However, it's very tight inside. The shelves have barely enough vertical clearance to accommodate different types of wine. One other thing, I miss having the inside lights illuminate automatically when the door is opened. Nice looking fridge, but reason for 3 stars is door has to open more than 90 degrees to pull shelves out. When opened just past 90 degrees, the shelves bump up against the door seal. This is really inconvenient as it was installed in a space where door can only open a few inches past 90 degrees. So i have to use my fingers to push down door seal so shelves pull out. We measured, you had exact, we bought, you delivered on time, we are very pleased, we would recommend this one, we shopped around, you had the best selection and price, and we thank you. I purchased this Wine Refrigerator as a wedding gift for my daughter and her husband. There was a hole on the outside of the shipping box we did not notice when it was dropped off. The glass door was smashed and we took pictures and contacted customer service. We received a new refrigerator within a week and are completely satisfied with the quiet and efficient design. It was placed within their kitchen island. We feel confident with purchasing products from Wine Enthusiast because they stand behind there products! Side Note: The instructions are difficult to comprehend and my daughter says she cannot get the temperature to change from Celsius to Fahrenheit. Great find for the exact dimensions needed. Looks great and serves a purpose. I still haven't figured out how to change the reading from C to F, but I will when I have time. Installed without a problem. Holds the required temperatures. Very quiet. Looks fine under the counter. The fridge is beautiful and works perfectly, except for one flaw. You cannot fit anywhere near the number of bottles as advertised. My chiller in at my wet bar between kitchen and family room. It is quite audible when cooling. I did not expect this and wish I had known. The wine cooler seems fine- it fit easily into the opening under my counter. I had read from a previous review that the diections were not complete but once the person spoke to a clerk, it was easily set up: I had the same experience and I wonder why the instructions have not been clarified? Also there was a very sharp piece of metal Alaina the bottom of the unit . I didn't find that out until it was too late and I really scratched my floor. I am pleased with the initial operation of this Wine Refrigerator. It has maintained it's temperature and run reasonably quietly. My only issue was the lack of acceptable instructions for operation. I HAD to call 'Customer Service' for help, which took far too long. The written instructions were unhelpful at best. But, the Technical Service eventually provided was quick and expertly give, so that it took less than five minutes to get the thing working as it was meant too. Pretty refrigerator, but not the best for white wines. Very nice looking, the pull-out shelves are nice. The packing for the refrigerator indicates that it is a red wine refrigerator, therefore most white wine bottles are too large to fit in most of the shelves. You can squeeze some bottles in which then rub against the next shelf up, also putting 5 bottles on a shelf (3 facing one way the 2 facing the other way) doesn't always work because the bottles must lay flat on the shelves and the bottle's necks don't always fit between the other bottles. The fan is also quite noisy, we are hoping that sound proofing material will help reduce the disruption when the fan kicks on. If the shelves were adjustable for height I would rate the refrigerator higher than 3 stars. There are lots of other choices out there, this might not be my first choice after discovering it is a red wine refrigerator. I saw a similar refrigerator at Costco and decided to order this refrigerator directly from Wine Enthusiast because of the great reviews online. The delivery came as promised inside our home. Once set up I needed to get technical support to switch the factory preset thermometer from Celcius to Fahrenheit. Their technical support is fantastic, (thanks Mike) and in a matter of moments had the issue resolved. No more taking up room in the kitchen refrigerator; we stocked our under the counter refrigerator full of red and white wine and are enjoying this purchase in our new family room. A must have to complete any home bar or rec room. Just received the unit. Oddly it did not fit into the place where it was replacing a different maker's 15" under counter unit. Fortunately that was easily taken care of. It is a nice looking piece, seem to run a little noisy but that was expected in this type of refrigerator. It advertises a 30 bottle capacity but I found with a mixture of different wines that the shelves could only accommodate Pinots and Chardonnays on the top or bottom shelf. Further the shelves seem a bit shorter than others I have used. You should be able to get 5 bottles on a shelf, however with some bottles of the same varietals being slightly different in length, I found the shelves could not take all five. This is my third of this size and I've never seen this before. Regardless, this was never intended for long term storage, just to keep them cool until I could get around to drinking them. It's not perfect but is as good as anything similar on the market. Better than Vinotemp for sure. Loud and small for some wine bottles. Probably would purchase something less noisy if I could do it over again. Also poor directions...I had to call for some basic things when setting up. Cold yes, but it just runs and runs and is loud. Pretty easy to set up. Keeps the wine cold. But it just runs and runs and it's loud. I wouldn't recommend it if you're putting in a room that you inhabit often. It's November. 75 degrees in our house, it's away from any sort of direct sunlight and I have the temp set in the fridge at 61 and it seems to struggle. Refrigerator settings are in Celsius and nothing in instruction manual explains how to change it. Customer service is non-existent, promises to call back with information and does not. Refrigerator door handle comes unattached and the screws provided do not attach handle so I have a wine fridge with no handle. I am very sorry for any inconvenience. I have searched for your order, but am unable to find it with the email address. If you would like to discuss this issue further, please contact me directly at klennox@wineenthusiast.net Thank you! Great quality and beautiful addition to our kitchen! So easy to install and fits perfectly! I would definitely recommend. I am very please with the wine cooler. However, the instruction booklet was incorrect. My contractor had to call to get the proper instructions, and the company was aware that their instruction booklet was not correct. Please edit your booklet to turn on the light and change the temperature. Your must hold the "Lock" button until it beeps. Then make the changes. The refrigerator fits in the space the old trash compactor use to be. The refrigerator is easy to install. It looks and fits well into the kitchen. Glad I bought it. We love it it is a proper refrigerator not a cooler so all white and champagne is so nice and cold all the time. The old trash smasher had been broken for years and needed to be replaced with something. I did the install and am happy with the looks and how quiet it is. I did have to belt sand one side to widen a little (Old English fixed that). It’s a right open and 2.5 inches away from the side of the refrigerator. Trying to reverse the door was a miserable experience. The buttons pop off and I had to drill the holes. Then, the hinge screws are not stainless steal and I started to strip one so I stopped and decided to install as is. The trays slide out with the door open 90 degrees. At 90 degrees open the door was still 2 and 1/8th inches from the refrigerator door. The company sent me additional plugs to refill the drilled holes. I’m very happy and it’s a positive addition to the kitchen. It is beautiful, especially the wood shelves, that add a touch of class. It keeps the temperature at 53F, which is perfect for both reds and whites, allowing the aroma and bouquet to shine through. Too cold and the aromatics are lost. Too warm ("room temperature"--80?) and you only smell alcohol. Note: 53 is what I set, and it holds it well. It fit right into my trash compactor space. White glove deliverers put it there, plugged it in and made sure it was cooling, and took away my old wine cooler and packaging. I'm happy. I bought two of these and love them. I needed a narrow wine frig and these are great. They were easy to install, set temperature, and install door handles. They are such great fridges! I highly recommend them. And, The Wine Enthusiast was wonderful to deal with! Am thrilled with my cooler! Also found the buying and service experience to be excellent and above industry standards. Came in great shape and began operating easily. However, required a call to tech support because the manual didnâ? ?t describe how to â??unlockâ?? the console. Once you learn that you need to press the unlock button for 5 sec, it is easy to use. Seems to maintain a steady temp. This fridge fit our remodel plan perfectly It's not overly large but that was not the primary need. It does keep plenty of bottles at the perfect temperature, ready to drink. My only ding is that it is not extremely quiet. It's not loud but it's definitely not silent. Good amount of storage; do you really need to keep more white wine chilled? A little noisier than would be most desirable but location minimizes issue. Automatic locking of panel is a bother until you get the hang of it. It is cool enough, but makes more noise than we like! I got this refrigerator about 3 weeks ago, and I am satisfied with it. This unit is very quiet, even quieter than my Eurocave. It is good for Bordeaux size bottles. Pinot Noir, Reisling and Turley bottles fit on the top and bottom shelves, but not so well on the other shelves. However, I knew that these bottles wouldn't fit well before I bought it, so I'm not disappointed about that. What I was disappointed about was the width of the unit. At the top, the unit measured 15 inches wide. About 2/3's of the way down from the top, it measured 15 and 3/32's wide. The sides actually bowed out slightly, and therefore the unit did not fit into the under-counter space. I had a 15 inch wide ULine refrigerator in this space before and it quit running. I had a carpenter take the trim off the cabinetry and shave off 3/16's so that the unit would fit. If you are looking for an under-counter unit, I would recommend this one, but make sure you have a space that measures 15 and 1/4 inches wide. I like the Wine Cooler it fits the space well where my last cooler that die was. The light from the number setting acts as a nightlight. I’m still playing around with the temperature setting. The look is fantasic! The only thing I don’t like I had to take two shelves out because it does not fit regular size bottles with all the shelves in. Unit is basically as described. White glove service was great. They took my old unit out to the curb and were very professional. Directions could be better especially when it comes to explaining how to change from Celsius to Fahrenheit and the need to hold buttons down for 5 seconds in order to get other functional buttons to work (eg: the light). Not as quiet as my prior unit but not much of a distraction at all. Keeps perfect temperature levels. This wine cooler is exactly what I wanted, but there are a couple of caveats if you are in the market. First, I wanted a left-swing door, which worked out OK since this model has all the requisite hardware, etc., to convert. However, there are no instructions how to do it, so I spent much more time and effort to switch the swing than needed. Customer service was great, however, and with their help, I got it done without too much of a problem. It would have been nice if the option was available to order it configured as needed. Capacity is what I expected, but since I seem to favor wine in odd size bottles, mostly oversize, you must be patient and innovative to maximize use. Finally, it is a bit noisier than I wanted, but the U-Line reefer I replaced was just a bit quieter, so it's perfectly acceptable for the bar area. Other than these quibbles, it's a well-made, efficient wine cooler for your bar or kitchen. One last note--the dimensions given are not precise. My unit was 33.5 inches tall, and slid into the bar recess easily. I was expecting some problem with fitting it in since my opening was exactly 34 inches. Upon review, I see that my model was actually listed as 33.5 inches in the accompanying literature. If you are constrained by measurements, be sure to ask for exact dimensions. the wine frig. delivery was great, they called and scheduled a time. Installation was not too difficult. took the most time figuring out how to set the temperature, there is a lock feature on the temperature setting. In fairness, our last wine fridge was very high end even though it was the same size as this one. However, this one is rather loud and the glides on the shelves aren't as smooth as I would like them to be. Still, so far the product seems fair for the price we paid and the free delivery. Packaging for shipment was well designed. Unit fit perfectly in space left behind from trash compactor. Installing the handle was not too difficult. Controls are straight forward, easy to use. Relatively quiet operation; makes some interesting sounds from time-to-time but nothing too loud or offensive. Loading bottles of various sizes can be like trying to solve a puzzle but is expected for this size unit I suppose. I would recommend this product to others. Product works as advertised. I initially thought that it didn't work. Turns out it was locked. How to unlock it should be included in the manual so that a phone call would not have been necessary. The unit looks good and holds the temp OK. The shelves only hold 4 normal bottles. So far I am pleased with my unit. The unit is quiet and holds a steady temperature. It does make an insignificant amount of noise when the compressor kicks on but that noise is negligible. The unit overall looks fine. My only 2 slight/minor complaints are that it only holds 26 bottles of the wines we use; Sauvignon Blanc, Reisling, Mostly Cabernet Sauvignon, some Pinot Noir and Chianti. Also, you need to open the door to see your reading. Lastly, the blue Accent light is very nice BUT it only illuminates the top 2 shelves, there should be a few lights on the side to light up all the shelves. Overall I am happy with this 15 Inch under counter unit. Easy set up, seems like a quality wine refrigerator for the money! Works well, quiet, maintains temp. Bottle capacity is somewhat less than expected, but roller bearing shelves are great. We waited 24 hours after unpacking before plugging it in to let the refrigerant settle as per the instructions. All refrigerated appliances should be handled this way.Wish designers would allow more space between shelves for the stupid fat bottles which are increasingly common. All brands seem to overlook this. The unit looks good and seems to work well. The temperature range that it holds is within 6 degrees, which is more than anticipated. Installing the door handle was tricky because the screw holes don't align and you need to angle past an internal metal barrier. Be aware that despite claiming to deliver through the first door to a house, which I confirmed by phone, the delivery person refused to bring the unit up a flight of stairs outside to the front door, saying he wasn't supposed to do that and would have needed a helper. I did it myself instead. Seems pretty much identical to many competitive units at similar price points. Looks nice inside and out. Needed to switch the handle from the left to the right - NO directions, and very, very difficult to do, beginning with nearly-impossible plugs to remove (which cover the holes for the opposite hinge and door handle), and very high risk of scratching aluminum. Shelf space is definitely for only thin red wine bottles - never a champagne, chardonnay or pinot noir bottle except at bottom. Condenser is relatively quiet but makes intermittent, periodic "burping" or "grunting" sounds - odd, and don't know if this is a problem, as its new. Automatically buried in email now from Wine Express. We had another brand wine cooler in the space and couldn't hear it. This one runs noisy all he time and it isn't even summer in Florida yet. At this price level, I would have expected better.